Europeforvisitors.com is a "Best of the Web" editorial site that reaches nearly 200,000 highly-educated, high-income readers per month. We cater to independent leisure travelers and cruisers who are researching where to go, what to do, and how to spend their money in Europe. For detailed traffic and demographics data (with tables), please see our "Audience" page. For reader and vendor testimonals, click here. 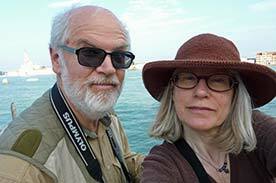 ABOVE: Durant and Cheryl Imboden in Venice, Italy. Europe for Visitors began as "The Baby Boomer's Venice" in early 1996, followed by Venice for Visitors and Switzerland for Visitors when The Mining Co. (later to become About.com) was launched in 1997. These topics soon expanded into Europe for Visitors and Switzerland/Austria for Visitors, and one of us (Durant Imboden) also found time to write a guidebook, Buying Travel Services on the Internet, for McGraw-Hill. Our relationship with About.com ended in fall, 2001. Since then, we've acquired our own domains and placed our copyrighted material on five tightly integrated sites within Europeforvisitors.com: Europe for Visitors, Venice for Visitors, Paris for Visitors, Rome for Visitors, and Europe for Cruisers. These editorial "content sites" provide more than 6,000 pages of original articles, annotated links to other Web sites, and additional travel-planning resources that are specifically geared to European travel and cruising--primarily in Western and Atlantic Europe, which are the areas of Europe that we know best. To serve our readers, we travel extensively and have an annual travel budget in the five figures. We also work closely with European tourist offices and other organizations to deliver in-depth coverage of destinations, cruises, and other travel experiences in Europe.